Councillor Norma Wilburn is Cabinet Member for Culture and Leisure at Stockton-On-Tees Borough Council and is committed to providing quality experiences and support for the people of the Borough. Here are her thoughts about the value of libraries in helping to support a diverse community. In Stockton what is essential to the wellbeing, education and cohesion of our communities? I believe our libraries are. They are not just a nice thing to have - they really do contribute to a wide range of needs and in Stockton, they are integral to the provision of health services and advice; they support children’s centres; education; arts and culture, regeneration and community safety. In addition each and every Stockton Borough Council library is a safe place to be for members of our community, accepting and open to all. As a Lead Member for Arts and Culture, I am very conscious of our Council focus on delivering services to people with the greatest need. In Stockton our community is very diverse both in background and in circumstances and we know that the greatest need may not just be financial. We support people with a wide range of disabilities or specific needs, those who need support for learning, people who are isolated and lonely or in poor health. We are keen to break the silos that can exist in any organisation so that every part of our organisation is working together to meet the needs of our residents. Libraries can provide support in every aspect of our Council’s work. Stockton is a very cohesive community with a deserved reputation for working together to support communities and to help them to get the best from life. We frequently talk about partnerships and working within them, but many do not provide a recognisable result. In Stockton we are dedicated to getting the most out of the relationships and partnerships that we forge – we all benefit from sharing resources and expertise and the important thing is that our communities are supported more effectively. Across our Council and certainly in our library service, we recognise and grasp opportunities to share buildings, expertise and effort for the benefit of our residents. 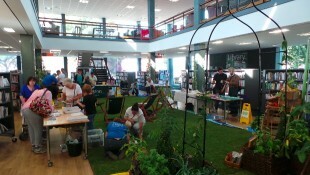 When the Central Library in Stockton was 'turfed' for a consultation event for the Tees Valley Re-Discovered Project. In our library at Roseworth, for example, we have combined together a children’s centre, library and health information resource into an integrated facility with a really excellent family atmosphere. As well as the traditional library resources, a café provides a focal point for parents to relax while children read and play in the centre. Health visits are supplemented by the collection of information, resources and books and specialist staff are only steps away. 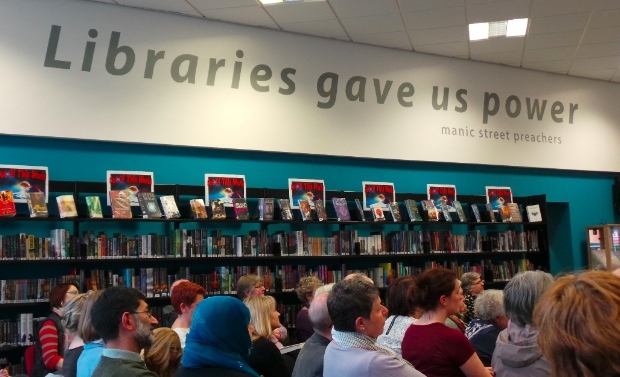 At our brand new library in the refurbished Billingham Town Centre, we saw an opportunity to come together with Billingham Town Council, an entirely independent body, in a building which provides a library, customer contact centre and Council base. 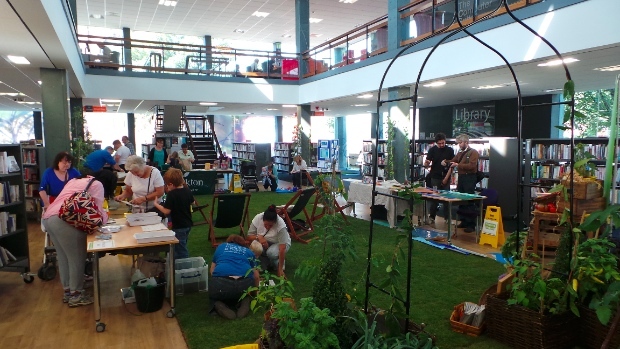 What’s more the library is now a focal point in the town centre to meet and socialise, borrow a book, discuss Council related enquiries or pay bills. In the next few months we will be beginning a refurbishment of Yarm Library and here we are talking to a local Building Society with the potential to house a small branch as part of the new arrangements. We see this as a useful merging of audiences and a support for people in the local area who would like financial advice. Beyond that we are also looking at the development of a shared building in Ingleby Barwick which will bring together a new swimming pool, leisure facility and library. As a Council we obviously have a range of priorities and we see the library service as an natural element in supporting us to deliver on these. Our libraries are fully signed up to the Society of Chief Librarians Universal Offers and these are very helpful in addressing many of the Council’s own priorities by providing training, resources and support networks. The health of our communities is a particularly important issue for us and the library service works closely with our public health team to help deliver on Books on Prescription. Our Sports Development Team works in close partnership with the library to encourage parents and children to be healthy and fit through their Funky Feet keep fit programme. Our library service delivers the Public Health Resource on behalf of the public health team, supporting health professionals and community organisations with information, resources, books, and online information using the public libraries and its infrastructure as a delivery network. The Dementia team have come together with a variety of different elements of the Council and with local organisations to ensure that Stockton is a dementia friendly place. 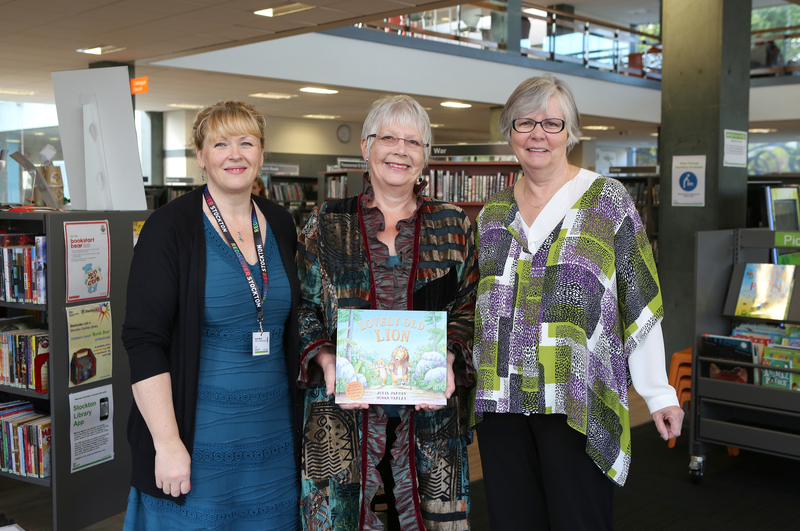 The library service plays its part in this, providing support for children and young people, training for staff, books and information as well as practical reminiscence sessions for people who live with the condition. The photo above was taken at the launch of Lovely Old Lion. This book was written as a result of the close relationship which the author Julia Jarman has developed with health librarian Karen Morris as a result of our long association with the Northern Children’s Book Festival. Karen suggested to Julia that there was a gap in the picture book market covering dementia for younger readers and this is the result. Learning is high priority and the Six Books Challenge [now renamed Reading Ahead] is always a popular initiative for us. Adult Learning tutors organise our students with support from the library for books and places to meet. An annual celebration of the achievements is always an emotional experience as we have so many dedicated and proud students who I was privileged to meet for the first time this year. World Book Night event in Thornaby central library. I could identify many, many different examples but I don’t want to forget that at the centre of our library offer is enjoyment – the sheer experience of reading for pleasure has its own particular role to play in supplementing health, learning and development. We share our enjoyment and our enthusiasm for writing and creativity with all ages, in the hope that this will maintain the reputation for ingenuity for which our community has become famous.